A good battery at a cost that is very attractive. Overall quality is very good and definitely recommend. Use this to power my F3 and Odyssey 7Q. Works perfect. This product is a good one. Have only used twice since purchase, but so far has performed as required. These guys are a little beefy but power my dp4 and 5d for 10+ hours. ordered 3 of them, they charge fast with the SCA2S 2-channel Charger. Perhaps this review should be written after using them 3 years but for now they are all good, im happy. We have bought two lots of charger + 4x Li160S batteries. They seem to be working very well and are the perfect capacity for PDW700s. They took a bit longer to get to us than advertised but the whole transaction was smooth, especially as you can do european bank transfers online from UK bank accounts now. Just keeps on running ! Have been buying these batteries over the last 5 years and used daily on a network show, they hold their charge and last for ages. 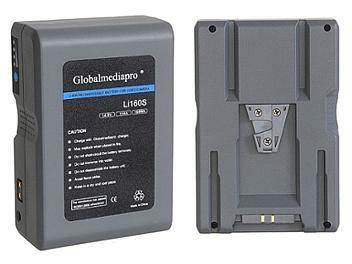 Great product, I have been using the Global Media Pro batteries for years now. These batteries are reliable every time and go the distance. Batterij van goede kwaliteit, controle op de batterij sterkte en een aansluiting voor opladen. Until now I didn´t use it a lot, but it seems to be a pretty good battery, especially for that price! recommendable!